LP with CD 450 numbered / heavy sleeve / 180 gram pressing / 2 page insert with liner notes + photos / CD with cover included What a lovely album this is. 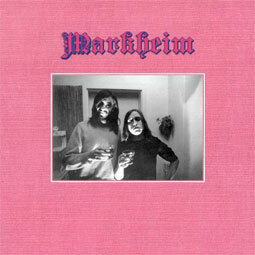 To most people still unknow this LP by the Swiss band Markheim was recorded in Venice, Italy 1972. Markheim was formed in 1972 by Andreas Wyden and dissolved the same year in lack of money, leaving some curious demo tapes behind. These guys lived in Paradiso, in the canton of Ticino (the italian speaking part of Switzerland). Andreas Wyden and drummer Enzo Geninazza are swiss but I have no information about pianist Phillip Reeves and guitarist Trevor Thoms. The band traveled to Venice during summer 72 in order to record their freshly composed songs. The the demo tapes were later on remastered by the poet Dubravko Pusek from Lugano who also financed the whole project ! All tracks and lyrics were composed by Andreas Wyden. The music itself is a mix of crazy progressive, folk and psych rock. Some tracks are rather experimental as well with a progressive touch. A very well produced studio recording. 10 demos of a hidden treasure from Switzerland, released in 1991 on a private label in for the first “ever” in a tiny edition of 200 LP´s The only band name reference we have found is a crime novel Markheim by Scottish writer Robert Louis Stevenson from 1885. We are not sure if the band name came from that novel. A good friend describe the special atmosphere on this album like this: "rustic, back porch strumming with that precious stones humming and a mind for the instant chopping of original wood"